The O’Neill Cylinder, designed by Princeton physicist Gerard K. O’Neill, is considerably larger than the other two designs, and is referred to as an “Island 3” or 3rd- generation space colony. The configuration consists of a pair of cylinders, each 20 miles long and 4 miles in diameter. Each cylinder has three land areas alternating with three windows, and three mirrors that open and close to form a day-night cycle inside. 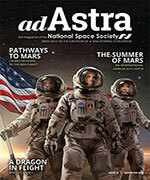 The total land area inside a pair of cylinders is about 500 square miles and can house several million people. The cylinders are always in pairs which rotate in opposite directions, cancelling out any gyroscopic effect that would otherwise make it difficult to keep them aimed toward the sun. O’Neill Cylinder exterior. 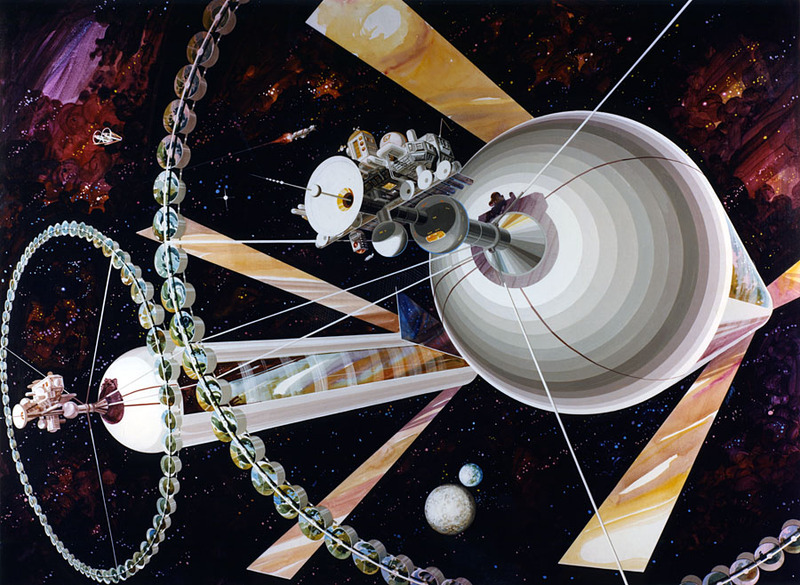 The modules on the large ring structure around the endcap are used for agriculture. Each module could have differing environments ideal for a particular set of food items. 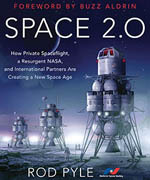 Painting by Rick Guidice courtesy of NASA. 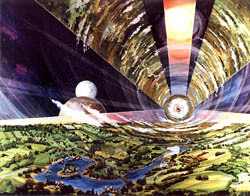 O’Neill Cylinder interior provides a 20-mile vista. Children born here would think it totally normal to have “upside down” land areas overhead. 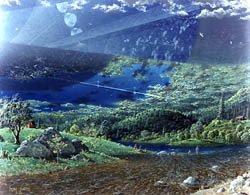 Painting by Rick Guidice courtesy of NASA. 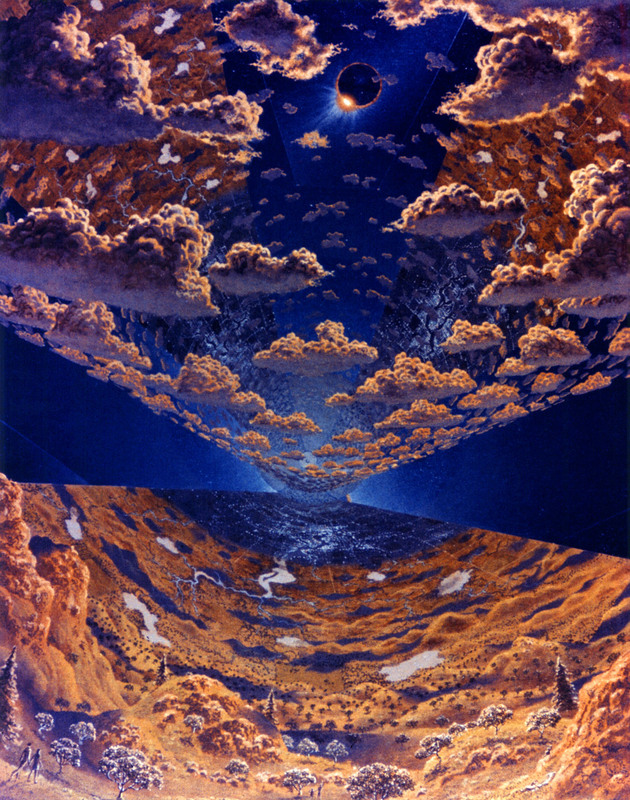 A dramatic side view of an O’Neill Cylinder showing a cloud level forming at an altitude of 3000 feet. Painting copyright by Don Davis courtesy of the artist. O’Neill Cylinder endcap. 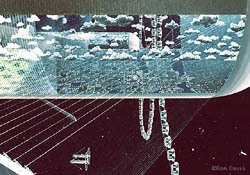 The artist’s inspiration came after O’Neill suggested to him that the view of San Francisco and the Golden Gate Bridge from Sausalito would provide an excellent scale reference for a later model cylindrical colony. 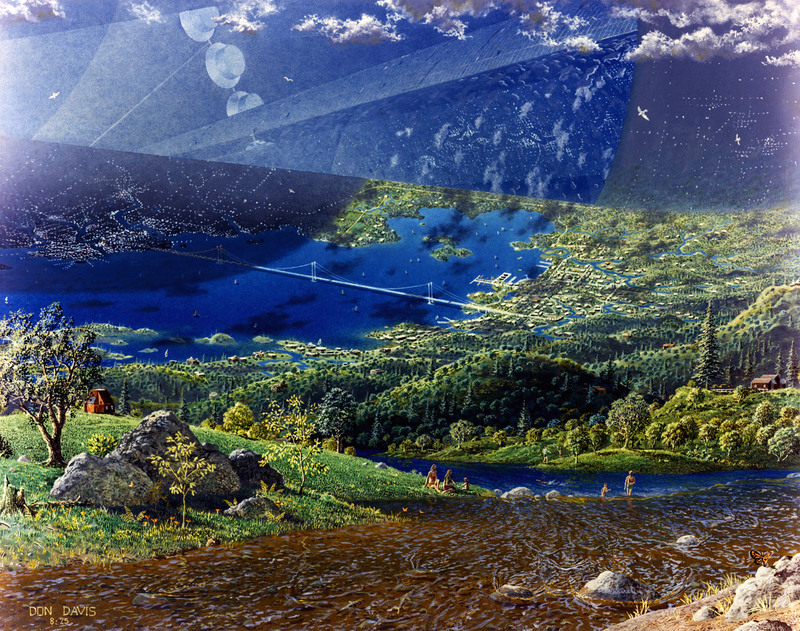 Painting by Don Davis courtesy of NASA. 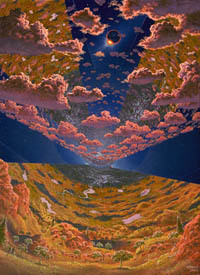 O’Neill Cylinder vista with ruddy hues caused by a solar eclipse (which would be more common at L5 than on Earth but still infrequent). The cylinders are large enough to have weather, which could even be made to change with the seasons, perhaps depending on a colonist vote. Painting by Don Davis courtesy of NASA. In his 1973 science fiction novel Rendezvous with Rama, Arthur C. Clarke provides a vivid description of a rotating cylindrical spaceship that is about 50% larger than the classic 20-mile long O’Neill Cylinder. Artist Eric Bruneton has created this striking 3D animation of Rama.